Crispy fried pomfret is one of my family’s highly sought-after dishes. 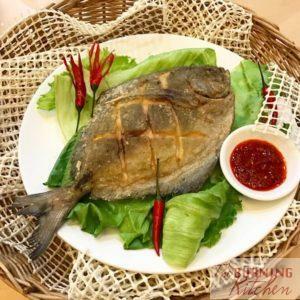 I once invited my former pastor and his wife to have a simple meal at my house, and one of the dishes I prepared was this crispy fried pomfret dish. After that day, he could not forget the crispy fried pomfret that he had, so he asked what ingredient I used for the dish to be so crispy on the outside yet moist and tender on the inside. I told him that I simply used a secret magic powder for the fish! Today I will unveil this well-kept secret to all TBK readers, so if you want to find out what my magic powder is, read on! It’s simple and easy to make! Only requiring 30 mins and 4 ingredients, whip up this dish if you’re short on time to cook! The texture of the fish is out of this world! Super crispy on the outside, such that you can even eat the tail and fins, yet the white meat is succulent and tender on the inside. HOW TO MAKE CRISPY FRIED POMFRET? Rub 1/4 tsp salt on the fish skin as well as the inside of the fish. Then coat the whole fish generously with corn flour (secret magic powder!) on both sides. 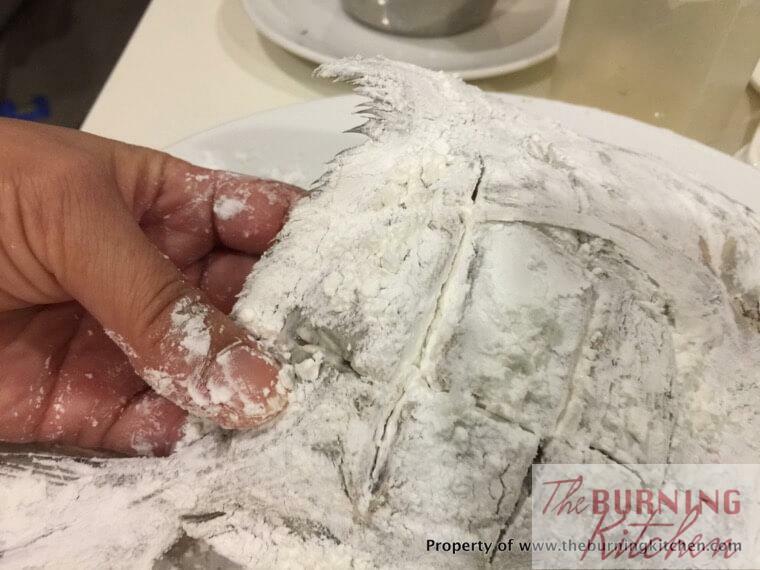 Make sure you coat the fish with corn flour inside the diagonal grooves too. In a wok, add in the oil and heat over high fire. 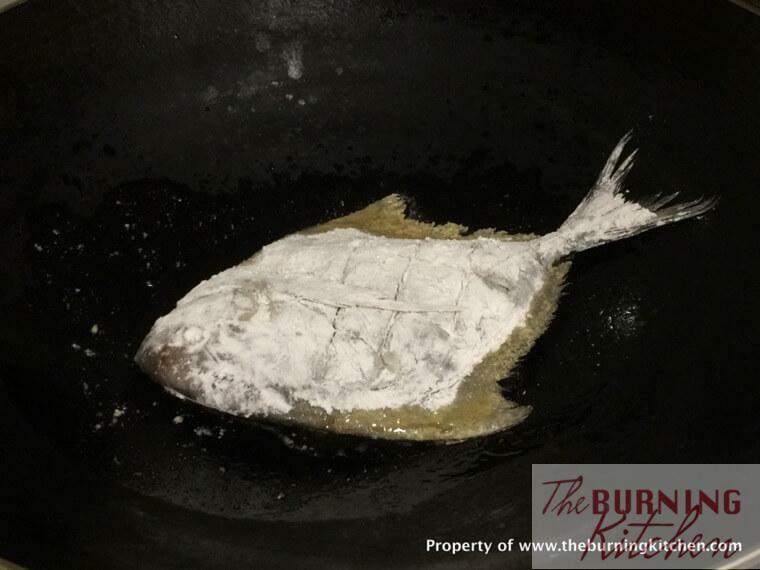 When the oil is boiling, shake off the extra flour from the fish and place it in the oil to fry for about 3-4 mins. Turn the fish over and fry for another 3-4 mins. Remove and place the fish on a kitchen towel to absorb the excess oil. Transfer the fish on a serving dish and serve hot with balachan chilli (optional) and lime (optional). Buy Black Pomfret for this dish. There are many types of pomfrets (white, golden, black, silver, Chinese), but the best pomfret for this dish is the Black Pomfret because the meat tends to be firmer, so its great for frying but I would not steam the Black pomfret for that same reason. Clean the fish properly, otherwise it will have an unpleasant smell of stale blood. See my post on 6 Simple Steps to Scale and Clean Your Fish Like A Pro for more details. Pat the fish dry before frying, otherwise it will not be crispy. Tilt the wok around if you are using less oil to deep fry the pomfret like I do in the photos above so that the whole fish can cook evenly. 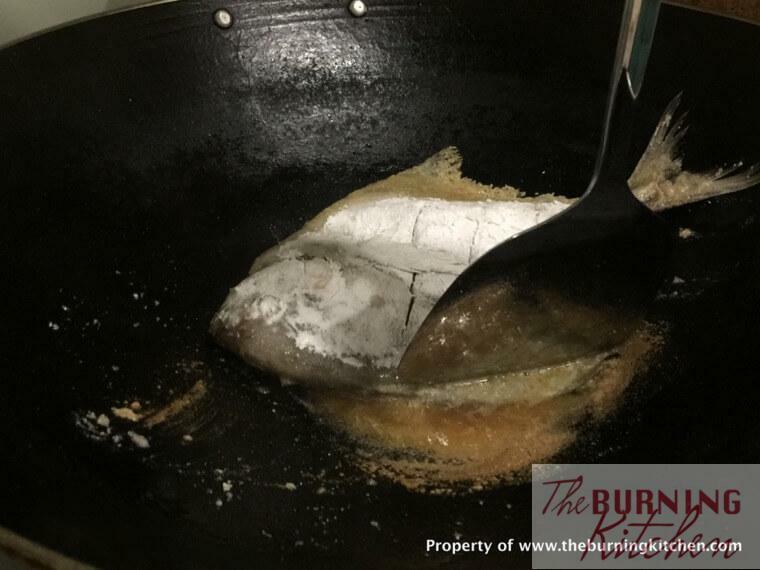 To make the fin and tail crispy, be sure to tilt the wok in such a way that the tail and the fin of the pomfret are fully immersed in the oil while frying. You need to use high heat to deep-fry the fish so the outside is crispy while the inside remains tender and moist. But make sure the fish doesn’t get burnt during frying. Watch the fire and lower the heat if necessary. Gluten-Free: No modifications needed, but check the label of the Sambal Belachan sauce to ensure it is gluten free. Shellfish-Free: Skip the Sambal Belachan which contains shrimp. 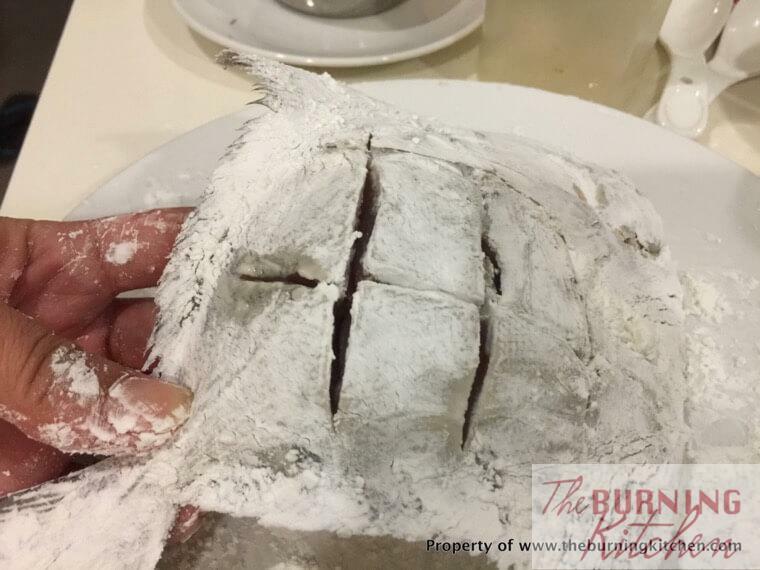 Ever wondered how to make Crispy fried Pomfret that is so crispy that even the fins and tail can be eaten? Come and find out the secret to the 'magic powder' used and make it for yourself! Rub 1/4 tsp salt on the fish skin as well as the inside of the fish. Then coat the whole fish generously with corn flour on both sides. You need to use high heat to deep-fry the fish so the outside is crispy while the inside remains tender and moist. But make sure the fish doesn't get burnt during frying. Watch the fire and lower the heat if necessary. Is the recipe calling for corn flour or corn starch? I bought corn flour but it has a shade of yellow which I don’t see in your photos. Thank you! Hi Amy, cornflour and cornstarch are the same. In the picture I used Pagoda Brand Corn flour. The slight tint of yellow doesn’t really matter. Can i use oven to bake it instead of pan frying ?